Preface. PART 1: VIENNA: 1885-1915. 1. The German Romantic Legacy. 2. Schoenberg to 1909: Extending Traditions. 3. Webern: Opus 1 to Opus 12. 4. Alban Berg Before Wozzeck. PART TWO: PARIS: 1885-1915. 5. Debussy: Impressionism and Symbolism. 6. Maurice Ravel to the Mallarme Songs (1913). 7. Exoticism: Importations from Abroad. 8. Symbolist Reverberations Abroad (I): Decadent Symbolism. 9. Symbolist Reverberations Abroad (II): Synesthetic Symbolism. PART THREE: EMEBLEMS OF CRISIS: 1909-1914. 10. Expressionism: The Path to Pierrot. 11. Primitivism: The Road to the Rite. 12. Futurism: Manifestos and Machines. 13. The New Simplicities: France. 14. The New Simplicities: Germany. 15. Toward Neoclassicism. 16. Zemlinsky's Lyric Symphony: Against the Tide. 17. Berg: Wozzeck and the Violin Concerto. 18. Weberns Path to the New Music. PART FIVE: EMERGING NATIONAL ASPIRATIONS: 1910-1945. 19. Hungary: Bela Bartok. 20. Russians Abroad and At Home. 21. The Twentieth-Century Spanish and English Renaissance. 22. An "American" Music for America. PART SIX: BEYOND NATIONALISM: 1920-1950. 23. Rituals, Liturgies, and Voices of War. PART SEVEN: POSTWAR SERIALISM AND THE RISE OF AN INTERNATIONAL AVANT-GARDE. 24. Europe: In Search of a Common Practice. 25. The United States of America. 26. Serialism and the European Old Guard. 27. The International Avant-Garde: Choice and Chance. PART EIGHT: THE QUEST FOR NEW SOUNDS. 28. Electronics and Explorations of Duration, Timbre, and Space. 29. The New Virtuosity. PART NINE: PAST IMPERFECT-FUTURE SUBJUNCTIVE. 30. Users of the Past: A Synthesis. 31. Users of the Past: The Generic Revivals. 32. Envoi. Notes. 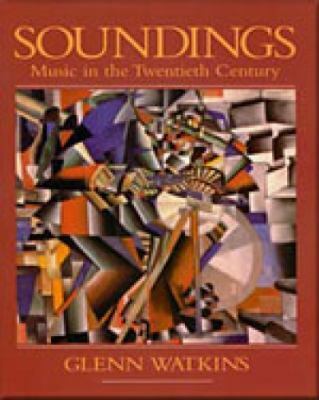 Index.Watkins, Glenn is the author of 'Soundings Music in the Twentieth Century', published 1988 under ISBN 9780028732909 and ISBN 0028732901. Loading marketplace prices 15 copies from $0.37 How does the rental process work?